An important part of great customer support is to connect with customers wherever they are. This probably means your Facebook Page, Facebook Messenger, Instagram, and Twitter accounts. Facebook page comments, page review comments, boostable post comments, and private messages (Messenger) through Facebook messenger work seamlessly with Re:amaze. When customers post problems or feedback on your Facebook page or Messenger, Re:amaze will pull in those comments so you can reply right within Re:amaze, never having to log into Facebook. You cannot publish new posts from Re:amaze since this is not a functionality Facebook supports. However, if you publish new posts in Facebook, Re:amaze will pull in your post as a new conversation. To connect a Facebook account, click on the "Settings" tab and select "Social Channels" on the left hand side. Click "+ New Social Channel" and then **"Connect Facebook Pages and Instagram". When prompted, please authorize Re:amaze with access so we can pull in new comments on your page. All of your account information is secure. You can always customize the import settings later. Instagram is becoming a very popular channel for supporting and interacting with customers. 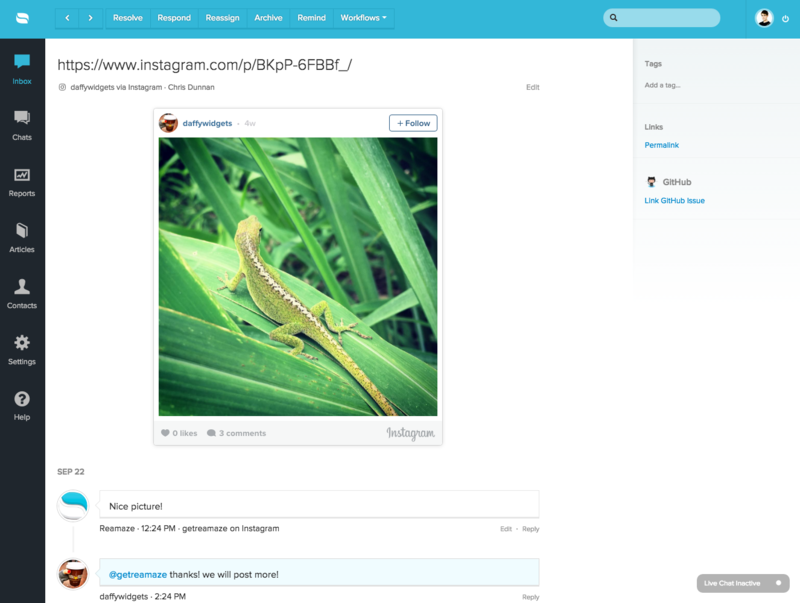 You can import your Instagram photos as well as comments directly into Re:amaze so you can start conversing with customers without ever needing to log into Instagram. Never lose another potential customer comment! You have the option to import all comments or use the smart import method to import just items you're mentioned in. Photos are also imported! To connect an Instagram account, click on the "Settings" tab and select "Social Channels" on the left hand side. Click "+ New Social Channel" and then **"Connect Facebook Pages and Instagram". When prompted, please authorize Re:amaze with access so we can pull in new comments on your page. All of your account information is secure. You can always customize the import settings later. Since Instagram now part of the Facebook family, you'll need to connect your Instagram account to your Facebook as a business account. To see how to do this, please see this article. Re:amaze is brilliant with Twitter. 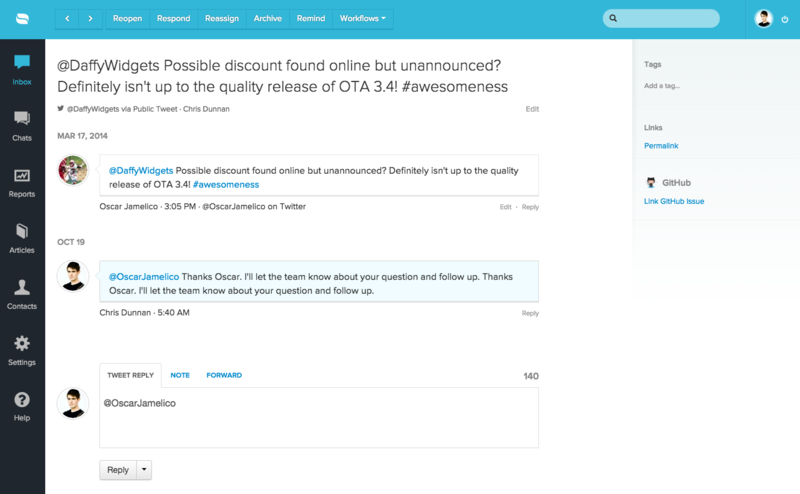 When customers tweet you, you can reply right from within Re:amaze. When you tweet your reply, Re:amaze will automatically limit your replies to the exact amount of characters that is allowed by Twitter. But what's even better is that you can tweet over Twitter's character limit. When you do, Re:amaze truncates your reply with a permalink so your customers can easily view the expanded conversation in a beautiful web interface. 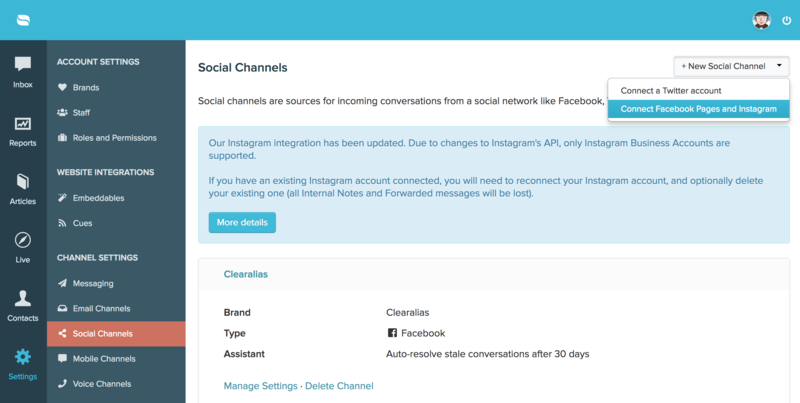 To connect a Twitter channel for support, click on the "Settings" tab and select "Social Integrations" on the left hand side. Click "+ New Social Channel". Select "Twitter". When prompted, please authorize Reamaze with access so we can pull in tweets. All of your account information is secure. You can always customize the import settings later.